People get really upset when they go to see a band and they don’t get to hear the hits. Some of them get impatient and start yelling out the titles, as if the band doesn’t know which songs are the popular ones. They fume if they don’t get the hits at all (I left a Bob Dylan concert once and heard someone in the parking lot complain that he had played only obscure material on a night that he had performed probably eight tracks from his greatest hits albums). Dylan certainly could provoke people this way. 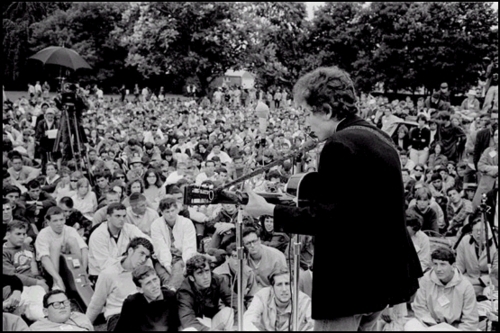 Dylan’s setlists at the Newport Folk Festival in July 1964 were not aimed at pleasing the crowd. It’s wasn’t as bad as the next year, when he would show up with a band in tow, but it was a remarkably hit free show. I am a little confused about what exactly he played and when (I received a dvd of The Other Side of the Mirror yesterday, but am not going to watch it until next week, maybe it will straighten me out), but it is clear that most of what he performed for the crowd were new songs. 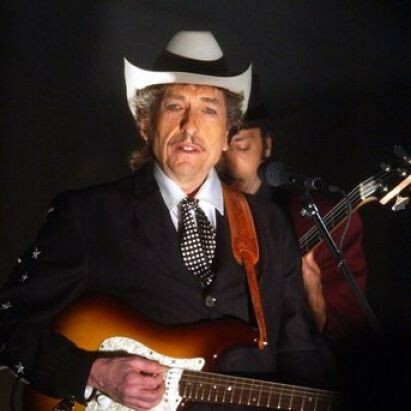 On the evening of July 26, for example, Bjorner.com has him playing three songs from Another Side of Bob Dylan (which was not yet recorded nor released), “With God on Our Side” (with Joan Baez), and “Mr. Tambourine Man” (which wouldn’t be released until Bringing It All Back Home in 1965). At other sessions during the festival he did another version of “Mr. 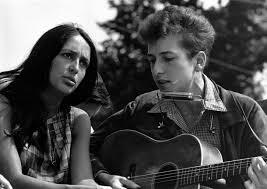 Tambourine Man” and “It Ain’t Me, Babe”, also from Another Side of Bob Dylan. Listening to the recordings, it is clear that the crowd is appreciative, but they don’t seem enraptured (it’s hard to tell how well the crowd sound was mic’ed though…). Dylan was in the process of not giving them what they wanted. All the biographies agree that the old line folk writers at the magazines were critical of his sets (too personal, not socially engaged, not traditional). Dylan simply advanced the break that was coming. Another Side of wouldn’t cause the inevitable rupture, but it signalled its inevitability and he gives them this material rather than his “voice of a generation” hits. As for the recordings, a nice version of “It Ain’t Me, Babe” with Joan Baez, but an absolutely off-putting “All I Really Want To Do” where he yodels too much to open his set on the final evening. That yodelling has to go, because combined with his refusal to really give his audience what they would’ve expected, it was semi-fortuitous that they didn’t turn on him a year early. Here he is playing “Mr. Tambourine Man” at an afternoon workshop. I love Pete Seeger sitting there in the background. 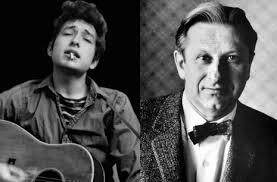 Of all the early interviews that I’ve now listened to with Dylan the best by far was conducted by Studs Terkel. The interview aired on WFMT in Chicago, and was recorded on April 26, 1963, the day after Dylan performed at The Bear. The interview runs for just over an hour, and Dylan performs seven songs. About half the time is taken up by a discussion between the two men, and you can hear the “voice of his generation” rhetoric really beginning to take hold. Terkel is a very good interviewer for Dylan. He is cognizant of all the things that Dylan is interested in, and more. When Dylan says that he is going to sing “Boots of Spanish Leather”, Terkel immediately assumes he means The Gypsy Davy, a folk song of great note. 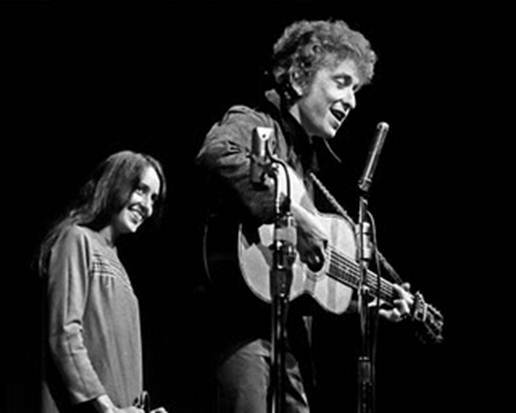 Dylan’s version borrows a bit from that – and he performs a version of The Gypsy Davy on some of the earlier tapes – but it is a different song. 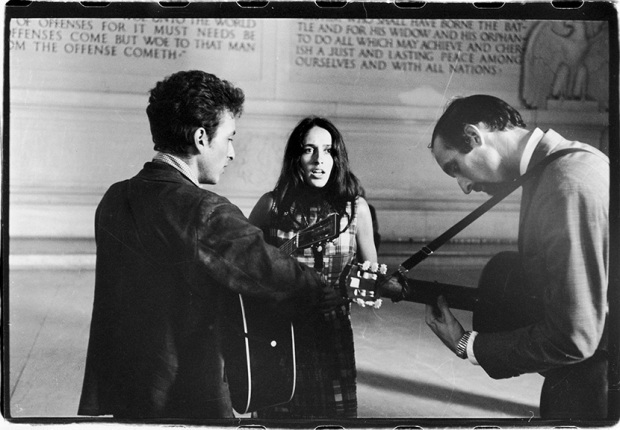 Still, Terkel’s instincts were right, and he is able to talk easily with Dylan about Woody Guthrie and Pete Seeger. Probably the most interesting segment of the interview is when the two talk about the differences between the politics of the 1930s and the emerging politics of the 1960s, which Terkel identifies as a tendency towards group identification (in the 1930s) as opposed to individualism (in the 1960s), and which the younger Dylan sees as the difference between a politics that assumed a right or wrong, with me or against me logic, and one that sees the world as filled with greys. Dylan gets lost a bit on a tangent trying to present an argument about the root causes of evil, but the whole thing is quite revealing of where he might have been with his thinking at the time. 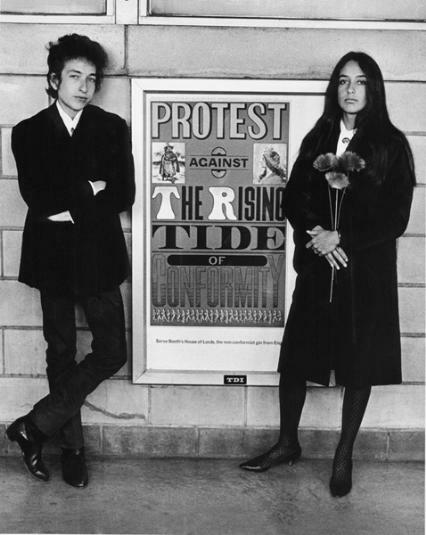 One thing that is striking about the interview is the off-handed way that it closes – Dylan suggests that he doesn’t really have an appropriate final song to sing, so Terkel says that they’ll just play something from his album (meaning Bob Dylan – Freewheelin’ wouldn’t be released for another three weeks) and then Dylan remembers that maybe he should play “Blowin’ in the Wind”. It’s a kind of cute moment where the young man seems to think “Oh, wait, I have a single to promote!”. The other thing that is remarkable about the interview, as with the earlier one conducted by Cynthia Gooding, is how enamoured Dylan’s interviewers are with him. Terkel can’t stop raving about his song-writing, and about how he seems to represent an entirely new way of looking at the world. At one point he reads from a letter that he’s received from an alienated, young man and asks for Dylan’s commentary on it. You can tell that Terkel thinks Dylan is an entirely new kind of being, and Dylan, at this point at least, is not averse to running with it. 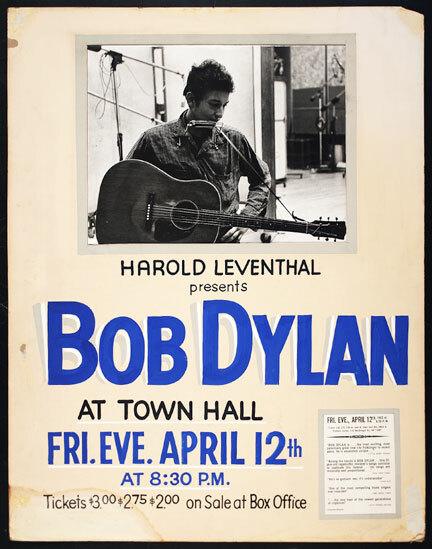 The best thing that I have discovered on this project to date, by a wide margin, is Dylan’s concert at Town Hall on April 12, 1963. A remarkably high quality recording of a tremendously good show, I’ve listened to this one three days in a row. A two set show featuring two dozen songs, and one poetry recital, this deserves an official release in the US (most of it was released in Europe on Bob Dylan 50th Anniversary Collection: 1963, and some of it shows up on the Bootleg Series – including two songs in Scorsese’s No Direction Home). That’s not what I keep noting though. What I keep noting is the way the audience expresses their love for young Mr. Dylan. Most obviously, there is the explosive, deep, sustained appreciative applause. These people (Robert Shelton claims an attendance of 900 in a 1200 seat venue) are listening hard, and reacting harder. 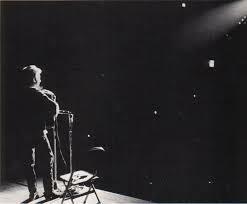 It is the first “big” Dylan show (and the first where he performed mostly his own songs), and the difference from the clubs (which often sounded as if there were ten people there) is noteworthy. The second thing that I noticed is the rude fans. Men mostly (okay, men exclusively), their job is to tell Dylan how to do his job. They yell out the names of his older (and newer) songs, demanding them as if he were a jukebox or a trained monkey. At one point Dylan denies a request for Hard Rain, only to play it later (heading into the break – a great way to end the first set). Someone calls for it in the middle of Dylan doing his stage patter, clearly throwing him off (though he recovers beautifully, and wittily). At another time he does accede to a request for Prett Peggy-o. I’m pretty sure that this was politeness, since he’s not doing other traditional songs in his set. He also introduces it by asking somewhat incredulously “You really want to hear that?”. Third, and most oddly, there are the fans who try to control the rude fans. The Town Hall show has an inordinate amount if shushing. People in the audience call out to Dylan and others (mostly women) quickly shush them. It seems at first to be a reaction to the rudeness but, more importantly, it seems to suggest a crowd that has a strong desire not to miss a single moment, a single aside, even the tuning of a guitar string. Personally, I hate the song-callers at shows. The best response I’ve ever heard to one came from Billy Bragg, who, denying a request for something or other, said: “That’s easy for you, mate. You just have to remember the title. I have to remember the words, the chords, and the witty banter that introduces it. Which is another way of saying you’re out of luck”. In a couple of years – at Newport, in Manchester – Dylan will get the rudest of song callers. But that would be getting ahead if myself. The shushers on the other hand are my kind of people – I’m trying not to miss a moment either.